I just read these words on the MI DNR website. Congratulations! You are successful in the 2011 Bear Drawing. It sounds like congratulations are in order. Now to the fun part. Congratulations and best of luck to you! And of course pictures will be required. If I get a bear, it will just be icing. Bear season is always a wonderful time to be up at the cabin and out and about in the woods and having an actual bear permit is an excellent good excuse for it. That's all the words you need. Great! Go after the big one. Congratulations Jeff, your adventures in bear hunting are always fun to read. I'm heading up this morning to help with some chores at the cabin, to pick up the ice cream for the pigroast, and check the two camera that Burlkraft and I put out before the fourth. Its good, I sampled some last month. Wow that sounds like a great flavor, ummm ummmmm. Are bears not very common in Michigan? Is that the reason for the lottery? 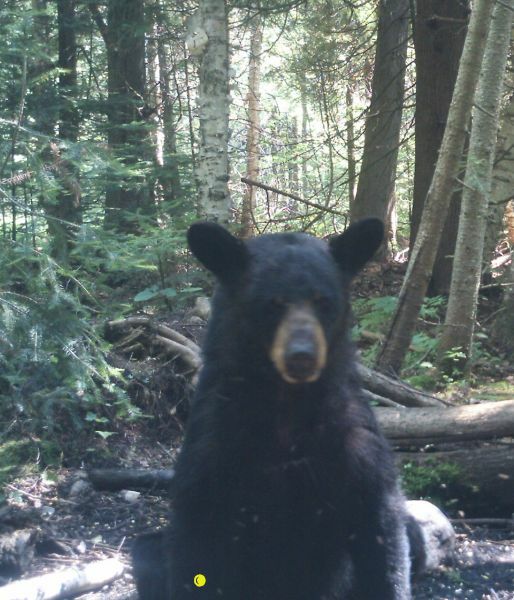 Here in VT you get a bear tag with your regular hunting license, and this year they are allowing you to buy a 2nd tag. Guess they think the populations getting a bit high. But, not many people strictly bear hunt. The majority of bears are shot in the week and a half that deer rifle season overlaps with bear season. Bears are common, but are tightly managed. We have 3/4s of a million deer hunters any given deer season, so a bear population would not have much of a chance with those numbers with a system like yours. I just checked the camera right behind the cabin and there is probably a couple dozen shots of probably two bears. THe Batteries went down on the camera so it looks like 10 days ago was the last picture. I've not been down to my property yet to check that camera. I suspect it will have photos on it as well. Here is one from out back. cool stuff jeff, not trying to turn the thread to food but do you eat the bear meat? and if so, do you have any reccommendations on recipes. ive heard of sausage from bear and roasts but what about steaks and such, maybe stew. i have only eaten roast from a bear many years ago. it was fine. Jeff is a bear hunter, but it might be best not to talk to Jeff about bear meat. Bear meat is essentially fat free, and really good. I've had it a number of times, but never shot one myself either. Just getting a little ahead of Jeff. Joined The Forestry Forum 5 days before 9/11. are you trying to say that jeff is a bear hunter that leans more towards conservation.... or is he merely very selective about his prey? I went down and grabbed the card out of the camera on my place. The mosquitoes might as well be bears. I got out of there as fast as I could. they are horrible! That a picture of a UP skeetoe? I was just sitting here relaxing after getting the mowing done and fixing an electrical problem created by a little critter building a home in the wrong spot, when I glanced out the window to see a skunk prancing into the yard right in broad daylight. By the time I got my camera, it disappeared to somewhere. 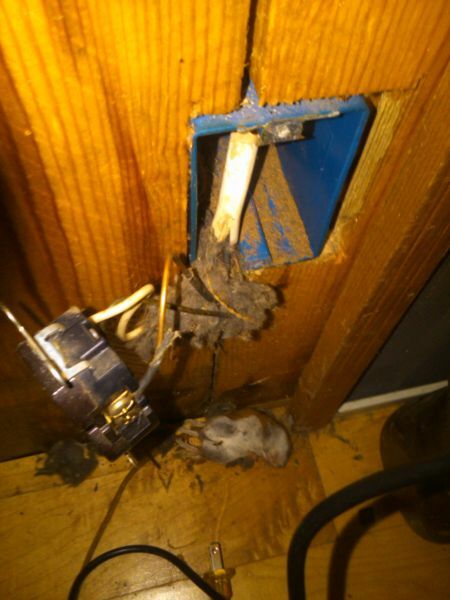 Here is the electrical problem I had to take care of. Page created in 0.861 seconds with 40 queries.